Acknowledged author David R. Anderson wrote Essentials of Business Analytics comprising 800 pages back in 2018. Textbook and etextbook are published under ISBN 1337406422 and 9781337406420. 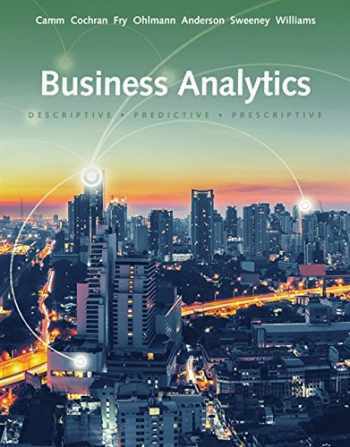 Since then Essentials of Business Analytics textbook received total rating of 3.5 stars and was available to sell back to BooksRun online for the top buyback price of $57.70 or rent at the marketplace. Build valuable skills that are in high demand in today's businesses with BUSINESS ANALYTICS, 3E. You master the full range of analytics as you strengthen your descriptive, predictive and prescriptive analytic skills. Real-world examples and visuals help illustrate data and results for each topic. Clear, step-by-step instructions for various software programs, including Microsoft Excel, Analytic Solver, and JMP Pro, teach you how to perform the analyses discussed. Practical, relevant problems at all levels of difficulty further help you apply what you've learned to succeed in your course.